This is the follow up to my last blog article, with some added information and pictures. 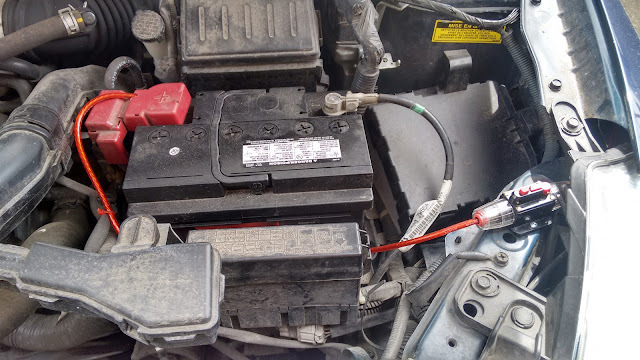 As you can see from the picture above, I drilled a small hole in the stock battery terminal cover, so as to have added protection for my wiring. 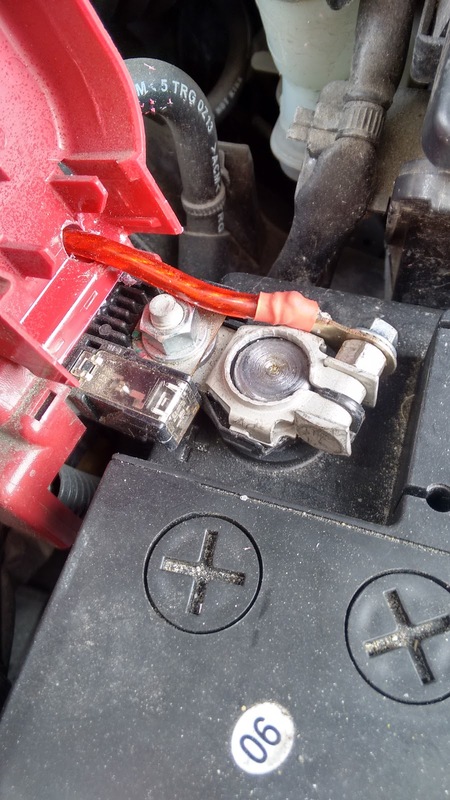 You can also noticed the previously mentioned soldered on ring terminal and heat shrink covering which connects to the car's battery. I wanted to keep the stock terminal protector, and by drilling a small hole large enough for my wire, I was able to maintain a rather stock look. I left a bit of slack on the new power wire in the event the battery needed to be serviced, so as not to be a burden in the future. The power wire makes it's way from the battery to the circuit breaker, where it then makes its way down the fender (behind the fender liner), and through the firewall. From the firewall the power wire makes its way along the door jams(under the carpet). The power wire terminates at a 4 way junction block located behind the rear, drivers side, seat. I already had this junction block in my spare parts drawer so it cost me nothing. You can find similar ones on EBay for about $6 (CAD). I ordered two 50cm long 5630SMD waterproof rigid strip light bars from EBay once again, for a cost of about $10 (CAD). 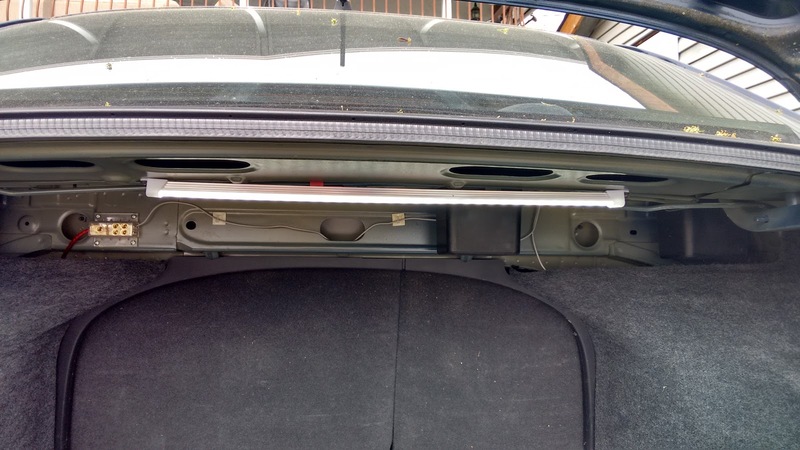 I mounted the light bar to the roof of the trunk, then ran a wire from the distribution block to the positive wire on the light bar (all visible in the photo above). 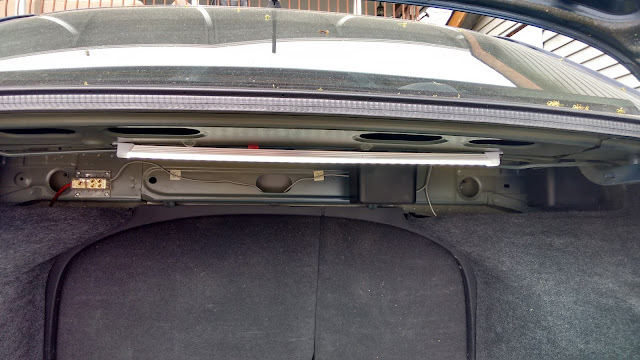 This is where things got a little tricky, as I wanted the light bar to turn on only when the trunk was opened. However I was unable to determine which factory wire reported an open trunk to the alarm. 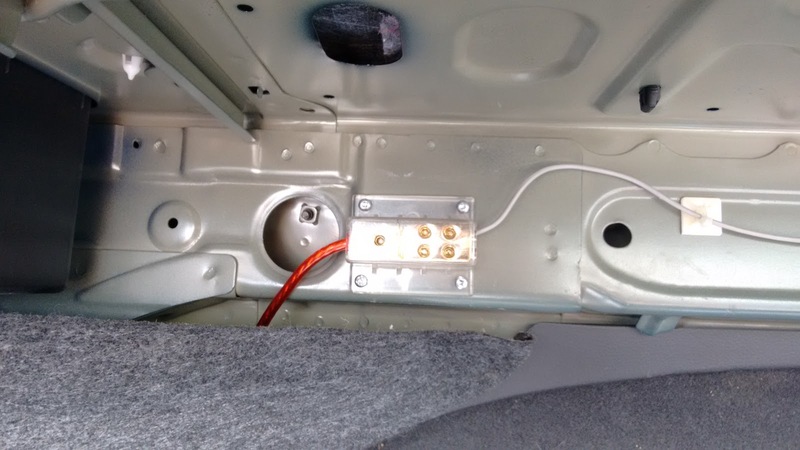 Originally I was going to install a standard aftermarket alarm trigger switch, which I could have done, but I didn't want to drill holes through trunk. Instead, on my brothers suggestion, I ordered a mercury tilt switch from Ebay at a cost of about $8 (CAD). A mercury tilt switch is a pretty simple device that sends a signal when its tilted. 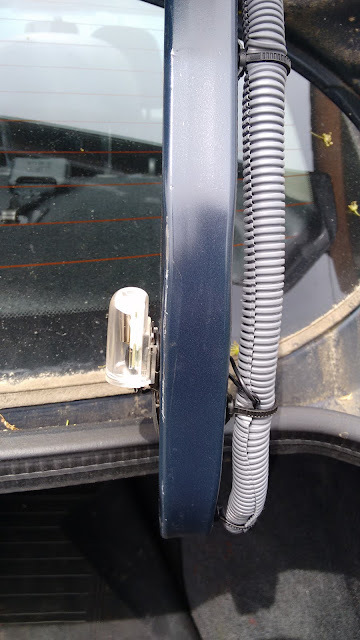 If I install it properly, it will turn the light bar on when the trunk is opened and turn off the light bar when the trunk is closed. 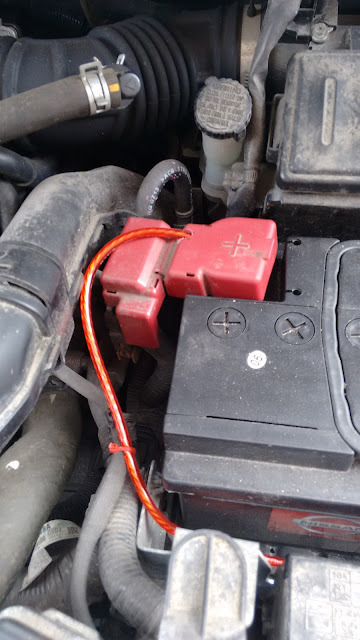 I installed the mercury switch to the arm of the trunk (there was an existing hole there), ran the wire into the stock wiring loom, so as to keep it looking neat and tidy. The mercury switch attached to the a common ground at one end and the light bar negative wire on the other end. Everything worked as expected, and now the versa'a trunk is very well lit. As a side note to those following along, I usually plan through the build ahead of time, then source out my supplies (usually from EBay). I do the actual builds after all my parts have arrived. Have a comment? Let me know below.